Cecil the Lion made international headlines this week after being killed illegally in Zimbabwe by an American dentist who allegedly paid about $55,000 for the privilege. Cecil was Zimbabwe’s most famous lion and a star attraction at Hwange National Park. The 13-year-old lion was also part of an ongoing Oxford University research project and was wearing a GPS collar to trace his movements. The hunter and/or his guides reportedly tried, but failed, to destroy the collar, which researchers used to trace Cecil’s last movements, and ultimately discover his headless and skinned body. The lion was apparently shot by a crossbow after being lured out of the park at night by the guides who dragged a dead animal from their vehicle. The dentist, Walter Palmer, hit Cecil with a crossbow bolt, but the injured lion managed to get away, only to be tracked down 40 hours later and dispatched with a gun shot. Two Zimbabwean guides have reportedly been arrested, while authorities are still searching for a third. No word yet on whether charges will be laid against the Minnesota dentist. A spokesperson for Palmer, meanwhile, said that his client is “obviously quite upset over everything.” But we’re not sure if that is just in reference to the flooding of his dental office Facebook page with angry comments and threats, and an online petition demanding justice for Cecil. The petition, which went online this morning, had garnered more than 40,000 signatures by mid day. The dentist is apparently a well known big game hunter who is in the archery record books for slaying an elk with a bow. He was also reportedly arrested by Wisconsin wildlife officials in 2008 for illegal bear hunting. A Flickr photo album by Trophy Hunt America contains shots of Palmer posing with a variety of dead animals, including a white rhinoceros, of which there are only about 20,000 left in the world. 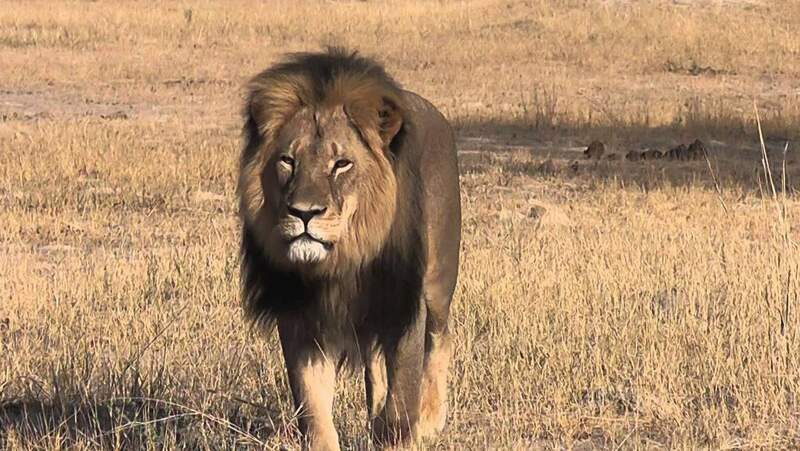 Conservationists in Zimbabwe and around the world are bemoaning the loss of Cecil, noting that Cecil is the 23 or 24th collared lion to be killed in or near Hwange. Conservationists have pointed out that the dentist paid just $50,000 to kill an animal that was worth millions of dollars in tourism revenues. Along with Cecil, the illegal hunt also likely means the death of Cecil’s six young cubs, as the next Alpha male will probably kill them so as to assert his own bloodline within Cecil’s former pride. OK, so this doesn’t even nudge the balance beam, but I tried. –Originally published by Hash It Out!, July 28, 2015.